Most photographs work to capture a single decisive moment. Each Airportrait is captured over an extended time period, anywhere from three hours to nearly sixteen hours. Using a stationary camera, every aircraft movement during the given time period is meticulously captured. The hundreds, sometimes thousands, of resulting images are then culled and each departing aircraft is cut, stitched, and assembled onto a background image taken during the same time period. 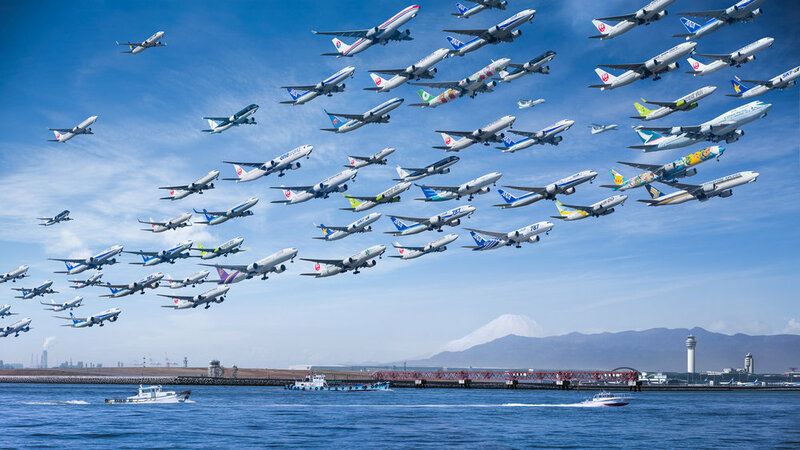 This process creates a temporally expanded composite image of the airport, showing a day's worth of air traffic and activity. When viewed this way, a linear process becomes translated into a visible and understandable documentation of the spectacle of aviation. At countless airports around the world, tens of thousands of flights per day are taking off, landing, and criss-crossing the skies overhead. From Zurich, there are cargo flights to Frankfurt, passenger flights to Singapore, and everywhere else between and beyond. From London to Los Angeles, Tokyo to Sydney. Further, however, there are many more questions that this image and series generate. What of the environmental effects of aviation? One plane in the sky does not seem to have a huge environmental impact - but when we see a day's worth of traffic at one airport and multiply it by all the days in the year and all the airports in the world, these effects cannot be negligible. What about the economic impact of aviation? How many people are directly employed by the airline industry (and indirectly, for that matter)? Or the financials and business decisions that are made every day to keep this operation running smoothly? Airportraits not only allows us to appreciate the beauty of aviation, but invites us to explore the often-overlooked details of this incredible industry. Aviation is a cornerstone of contemporary civilization and touches every corner of our lives in ways we may not even realize. The entire Airportraits series aims to capture the character, beauty, impacts, and scale of modern aviation in a way that a single photograph could not. To view the complete series or purchase prints, navigate to the shop by clicking here.